Offering you a complete choice of products which include vmax vacuum dewatering system, dewatering vacuum pump, vacuum de watering pump, 6 inch dewatering pumps, self priming vacuum assisted dewatering pump and vacuum dewatered flooring machine. 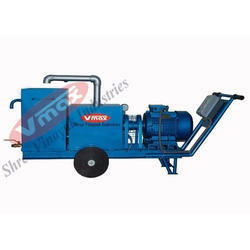 We are specially manufacture and supplier of Vmax Vacuum Dewatering System for concrete flooring work This system for used in concrete excess water and air so give fastly strength in concrete With industrial Revolution all over the World, the floor construction has been one of the serious Concerns of Architect, Engineers and users. A high quality concrete floor need not only be leveled it should also have a high compressive strength minimum water permeability and should minimized dusting at bare minimum cost. The Vmax vacuum dewatering system is designed to eliminate the ill effects of extra water presence inside the concrete through vacuum dewatering treatment. The surplus water is removed from the concrete, which means that the ratio of water in cement is drastically reduced after applying vacuum dewatering system. A lowered water/cement ratio automatically leads to noticeable improvement in almost each of concrete properties. Increase in Wear Resistance by 100 - 150%. The concrete floor gains earlier strength after applying vacuum treatment than normal way thus earlier utilization is possible. Gives fast simple and easy removal of excess water from concrete slab after compaction and leveling, allowing faster floor finishing. 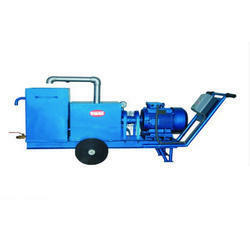 We are the of high-quality Dewatering Vacuum Pump A high-quality concrete floor or pavement requires not only to be level but it should also have high wear resistance, high comprehensive strength, reduced shrinkage and minimum water permeability. The dewatering operation takes approx. 1.5 - 2 minutes per centimeter thickness of the floor. The dewatered concrete is compacted and dried to such an extent that it is possible to walk on it without leaving any foot prints. This is the indication of concrete being properly dewatered and ready for finishing. We are the manufacturer of high-quality vacuumDe-Watering Pump. A high-quality concrete floor or pavement requires not only to be level but it should also have high wear resistance, high compressive strength, reduced shrinkage and minimum water permeability. The dewatering operation takes approx. 1.5 - 2 minutes per centimeter thickness of the floor. The dewatered concrete is compacted and dried to such an extent that it is possible to walk on it without leaving any foot prints. This is the indication of concrete being properly dewatered and ready for finishing. What are the Benefits of VDF Flooring? Our organization is placed among the noteworthy organizations, engaged in offering an excellent assortment of 6 Inch Dewatering Pumps. This mat is highly demanded in construction industries for growing productions. Manufactured by our skilled professionals using superior-quality components and progressive techniques, the offered mat is also tested on defined quality parameters to make sure its flawlessness. Besides this, we offer this mat to the clients at marginal prices within the promised time frame. With industrial Revolution all over the World, the floor construction has been one of the serious Concerns of Architect, Engineers and users. A high quality concrete floor need not only be leveled it should also have a high compressive strength minimum water permeability and should minimized dusting at bare minimum cost. The Self Priming Vacuum Assisted Dewatering Pump is designed to eliminate the ill effects of extra water presence inside the concrete through vacuum dewatering treatment. The surplus water is removed from the concrete, which means that the ratio of water in cement is drastically reduced after applying vacuum dewatering system. A lowered water/cement ratio automatically leads to noticeable improvement in almost each of concrete properties. It run by electrical motor.